This has boosted the Tories’ chances: our model now gives them a 79% chance of winning the most votes and a 79% chance of winning the most seats (both up from 74% last week). The probability of a Conservative majority is up to 20% (from 16%), while Labour’s hopes of a majority are virtually gone (our model gives them less than a 0.5% chance of one). The chances of a hung parliament are still high, at 80% (down slightly from 83%). 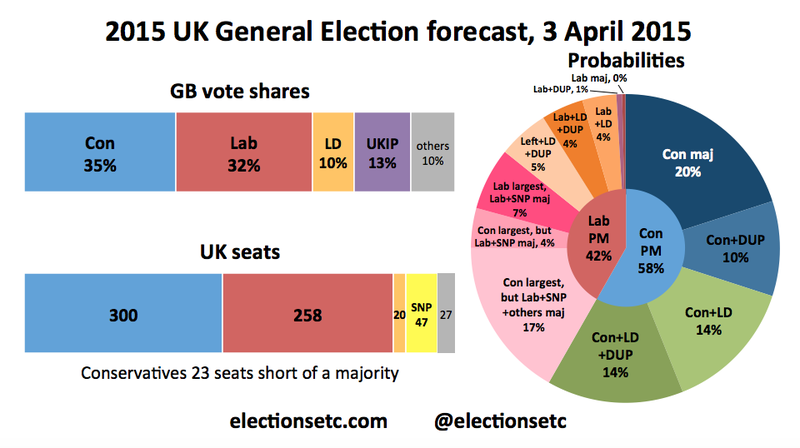 Our central forecast is for a hung parliament with the Conservatives clearly the largest party, with 35% of the vote and 300 seats to 32% and 258 for Labour. Pity you were not able to factor in the Tory 37% poll late last night. Presumably that would have affected your trend assumptions as well as current data. Before last night at what point did you expect them to poll 37% for the first time? I believe you are getting it right! I will be more than surprised if the Conservatives do not either win a small outright majority or get close to 325 seats. You now forecast that the Conservatives will win 300 seats and at this relatively late stage (I believe) they will gain momentum. Nothing in the ‘Paxman’ or ‘7 Leaders’ confrontations was damaging for Cameron, but the PM’s original caution when considering the debates is still understandable. As the incumbent he had potentially more to lose than gain. In the days ahead I expect to see Miliband mauled by the Scottish Nationalists, Welsh Nationalists, Greens and even The LibDems. We had a small taste last night. There will be a squeeze on the Labour vote as the LibDems come back in the polls (somewhat!) and many UKIP followers defect (or return) to the Conservatives! There will be multiple Scottish seat losses for Labour. The economic climate (and news) is likely to continue to be benign, and by early May the ‘feelgood’ factor should be more apparent! The Sun newspaper has already savaged Miliband today. Imagine what is to come from the Sun, Express, Mail, Telegraph, Times etc. as we approach polling day. Finally, I am certain that the anti-Miliband voters are more likely to take the trip to the polling booth than the anti-Cameron people. I suspect the new multi-party scene will produce new patterns of tactical voting which will throw out forecasts in unpredictable ways. Also, as Miliband gets more airtime the less impact from the propaganda from the Murdoch/Desmond/Rothermere rags will have. coalition could be on the cards. When Clegg says he wants to ‘finish the job’ and ‘balance the books,’ he has two options only. Firstly, he can finish the job and balance the books as part of a (continuing) LibDem/Conservative coalition, or secondly, he can finish the job as head of a LibDem government. The chances of a majority LibDem government are near to zero, so his only realistic option is to share power with the Conservatives. Labour has a different agenda, and so ‘finishing the job’ and balancing the books would not be a choice with a LibDem/Labour coalition. 2. If there will be a majority Conservative government after the election, well the LibDems will play no part. But if the Conservatives are the largest party – and nearly all polls point to this result – then who will they turn to turn to as coalition partners? We will surely have a re-run of 2010. And if the Lib Dems have around 30 seats (perhaps up to 35?) and the Conservatives 300 (maybe up to 315?) then, bingo – another LibDem/Conservative coalition is in the offing. To my mind this eventual result is much more likely as a scenario than the 6-1 (against) odds which the bookmakers are currently offering! 3. I am hearing a lot of people say that they would be quite happy with the prospect of another LibDem/Conservative coalition as opposed to the ‘nightmare scenario’ of a Labour government in hock to the Scottish Nationalists, Greens and Plaid Cymru. I am betting on the 2 most likely results as being a Conservative majority government (with a small majority) or another LibDem/Conservative coalition. Utter rubbish. A neck and neck race translates into an 80% chance of the Tories getting the most votes? Deluded rubbish from an Oxford Pal of Camerons. So what you’ve done here is to notice that your predictions from 2 years ago that the Tories would gain support in the months running up to the election, and end up with 40% support in May 2015, haven’t transpired. So because your model lost its pro-Tory bias, you’ve engineered a brand new Tory bias. Which doesn’t look remotely neutral to me. Will you be updating your forecast soon? Most other forecasters now have Labour as the largest party as the polls have remained static since the 4th, with maybe a slight movement up for Labour who have now inched ahead.